Alright everyone, break out your yoga mats, assume the lotus position, close your eyes and take a deep breath. (Ahhhh……) Now while we are cool, calm and collected, let’s talk about transitioning to Version 2. Upgrading is exciting because of all of the new features that have been added to Version 2 but it is not something that should be taken on lightly. While many of the day to day operations are the same, there are several little tweaks that can throw you off your groove and have you longing for the comfort and familiarity of Version 1. 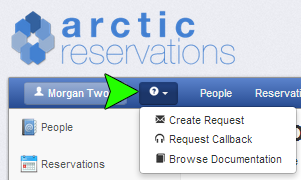 The Test Installations are perfect for introducing you and your reservationists to the new look and feel of Version 2. Realizing that several of you want to upgrade during your slow seasons so you are working with a diminished staff, it would still be good, if your lead reservationists, at the very least, were given a chance to look over the new system. Since Arctic is web based, your team could easily take Version 2 for a spin in the leisure of their own homes or maybe just spend an odd day at the office getting acquainted with the system. You can even have a “Version 2 Upgrade Party”, where you bring your staff in, just for a day or two, to play with the Test Installation. All of the existing log on’s for you and your staff will continue to work in the Test Installation, so no extra configuration is needed on your part to allow your staff access to the new version. I cannot emphasize enough how important this is to maintaining your Zen when upgrading to Version 2. Bottom line: Save yourself and your staff some stress and give everyone a turn to play with the Test Installation. You won’t regret it. Make sure everyone knows how to access the Support Menu and the Guide Documents and knows they can ask questions as they explore Version 2. All of these things are the tools you will need to create a good game plan for the final upgrade. Make a list of the things that will need to be adjusted and/or created to get you up and running after the upgrade and prioritize it. Having a plan like this will keep you from feeling overwhelmed. The upgrade is a two part process. The first part is importing all of your data into Version 2 and the second part is getting all of that data squared away and settled nicely; and don’t worry, Nathan and I will be there to help you get everything settled. Also as part of your game plan, make a list of the new features you want to take advantage of in Version 2 and prioritize it as well. Step 4: Stabilize First, then Re-structure. Once the transition has stabilized, then using your game plan as a guide, start adding the new features you want to take advantage of. Do this slowly and take them on one at a time. With many of the new features there are going to be things you need to consider before making the changes because you have existing reservations in the system. For instance, if you are going to start using the add-ons feature for your trips, you will need to be aware that you will have to make adjustments to your existing reservations once you implement this feature. Having a plan for how you want to accomplish this so that you know you won’t loose any data or miss anyone is going to be key to making the process a smooth one. Also approaching this slowly, one trip type at a time, provides a staggered way to learn about and experiment with the new features, without requiring manually reviewing all upcoming reservations. Again, remember the setup you achieved in Version 1 will continue to function post-transition, so it is not imperative to implement all of the new features available in Version 2 at once, especially, if you are running out of time before your reservation season really starts to kick in. If you don’t get everything added before you get too busy, you can still work to add these features slowly as you have time or you can put them on hold until business slows down again. Step 5: Take a Break and Breathe; It will all be O.K. Following the advice in Steps 1 – 4 will definitely help you maintain your Zen during the upgrade process but there are still going to be times when you feel overwhelmed. When that happens, take a break and breathe. When you are more centered, come back at it and don’t forget, Nathan and I are here to guide you through the process. We are happy to walk you through demonstrations on the Test Installations before you upgrade and to offer advice and guidance on how to go about getting settled into Version 2. With some planning and communication, you will find that the upgrade process goes smoothly and with a minimal amount of stress. However, if you approach the upgrade lightly without really preparing for it, it can be very stressful and frustrating. Version 2 is amazing and you and your staff will love it, but, as with any new relationship, you have to get to know it for that to happen.